If you missed out on purchasing a new luxury Coquitlam condo at Celadon Coquitlam high-rise, now is your chance to live in the community, but in a boutique enclave of low-rise residences. Polygon is announcing the launch of the Coquitlam Celadon House luxury apartments located in the Windsor Gate master planned community. Situated just next door to the Celadon high-rise tower, the Celadon House Coquitlam condos will feature Frank Lloyd Wright inspired architecture and design that is truly grand and distinct. The fine intricate details of the Celadon House Coquitlam apartments is seen throughout. From the well designed floor plans to the sunlight filled living spaces and from the polished stone finishes to the marble and sleek integrated appliances, everything about the Windsor Gate Celadon House Coquitlam condos for sale exude excellence in design and luxury. 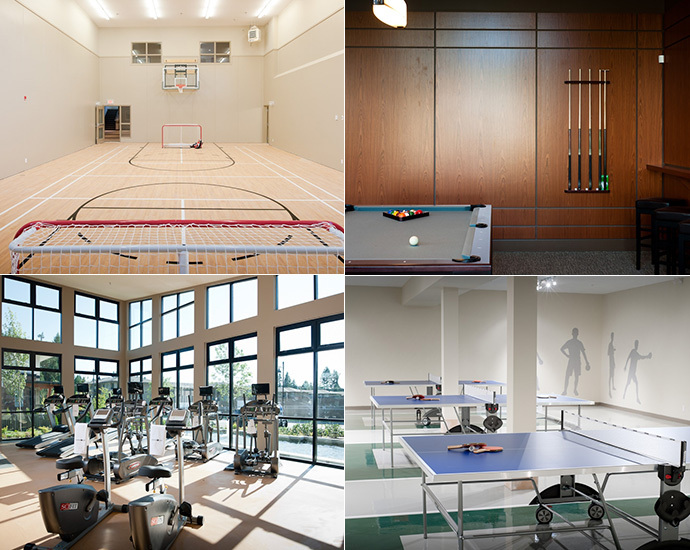 This boutique collection of low-rise residences will be more exclusive than the high-rise and not only that, but residents at the Celadon House Coquitlam condos will also have access to the private amenities at Celadon Windsor Gate called the Nakoma Club. The resort style Nakoma Club amenities include over 18,000 square feet of on site amenity spaces that includes a fitness gym, outdoor pool, landscaped terrace deck, screening room, guest suites, a resident concierge, lounge and a private clubhouse. 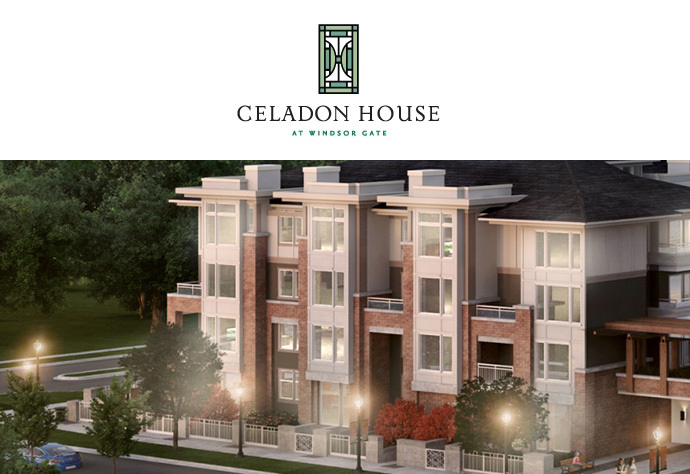 The Celadon House condos at Windsor Gate Coquitlam will feature ONLY 40 LUXURY APARTMENTS! Plus, you can move in THIS YEAR! NEW INFO > The Polygon Celadon House Opens Saturday, July 13th so please call 604.942.8416 for more details! 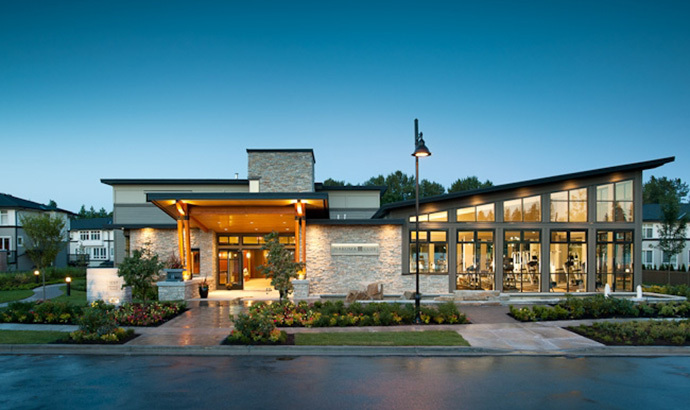 The Celadon House Sales Centre is located at 1128 Kensal Place Coquitlam, BC. Featuring contemporary solid wood entry doors and cerrera style interior doors, the Celadon House signature homes are absolutely stunning. There are colour schemes that are professionally selected and designed and the living areas have durable and beautiful laminate floors. As well, the homes have energy efficient and large low E windows throughout plus large outdoor living spaces. The Signature Homes at Celadon House Coquitlam also feature sophisticated kitchens with smooth engineered stone counters and full height, glass tiled backsplashes in addition to a coordinated high quality stainless steel appliance set by KitchenAid and Liebherr. Also, the ktichens have luxury and contemporary flat panel custom cabinetry with polished chrome pulls on lower cabinets. Other kitchen features include double stainless steel under mounted sinks, single lever faucet, laminate flooring and quiet soft close cabinet hardware, sleek under cabinet lighting and built in recycling/garbage station. The homes at Celadon House Coquitlam condos also feature laundry with conveneitn stacked washer and dryer, WatchTV or talk on the phone throughout your home with an abundance of outlets and telephone jacks as well as ample visitor parking. The designer bathrooms at the presale Coquitlam Celadon House condos have luxurious ensuites with richly designed oversized vanity mirrors, dual flush toilets, sumptuous contemporary rectangular soaker tub, overshized showers in select floor plans and sophisticated fixtures including natural imported marble counters and bakcplash, large format porcelain tiled floors and flat panel floating custom cabinets with modern pulls. All homes are backed by the Travelers Insurance Company of Canada 2/5/10 year home warranty. You can travel easily and protect your environment as every Celadon House Coquitlam home gets a 1 year one-zone transit pass! There are five designated car-share stalls on site as well, so you really don’t need to own a car to get around. All windows are low-E giving you healthier living spaces. As well, other environmentally friendly features include low-VOC paints that improve indoor air quality, built in recycling station, dual flush toilets and much more! Some custom choices for home buyers include additional secure storage lockers and bike lockers in addition to a wireless security alarm system. All common areas have key fob access and thre are digital recording cameras in the parkade and lobby for additional security. You can download the entire Coquitlam Celadon House condo features list online here. Only 40 low-rise Coquitlam boutique condos are available at the newest and last release at this Polygon Coquitlam master planned community! Called Celadon House Coquitlam, home buyers will find centrally located low-rise apartments for sale next to the luxurious Celadon high-rise tower. Presales are launching early July 2013 so please register your interest today at www.polyhomes.com. Move-ins are scheduled for THIS YEAR too! This exclusive collection of homes features spacious floor plans that are light filled. Standard high-end finishes include polished stone counters imported marble, and stainless steel appliances. Some of the nearby amenities include the Evergreen SkyTrain line as well as major transit routes. In addition, the pre-sale Coquitlam Celadon House apartments will be just steps away from the beautiful Lafarge Lake and Coquitlam River waterfront areas in addition to big box retailers and boutique shops at Coquitlam Centre Mall. Also nearby are top ranked schools (Pinetree Secondary School and the David Lam campus of Douglas College) and the rest of the Tri-Cities. Also, the Windsor Gate Celadon House condos are close to Westwood Plateau Golf and Country Club in addition to the West Coast Express station. More information is online at www.polyhomes.com. The Celadon House Coquitlam condos are brought to you by Polygon Celadon Homes Ltd. and Polygon Windsor Gate Ltd.